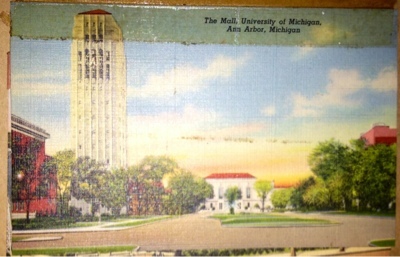 Postcard of the Bell Tower and Rackham, circa 1938. A few years ago, the Michigan Theater showed a great short silent film about the casting of the bell. I had honestly never thought about how that was done before. I mean, I knew bells didn't fly out of monkey's asses but I never thought about the work that goes into casting one...great film! Via Mary Morgan, here's a linkto the casting of the bell movie.